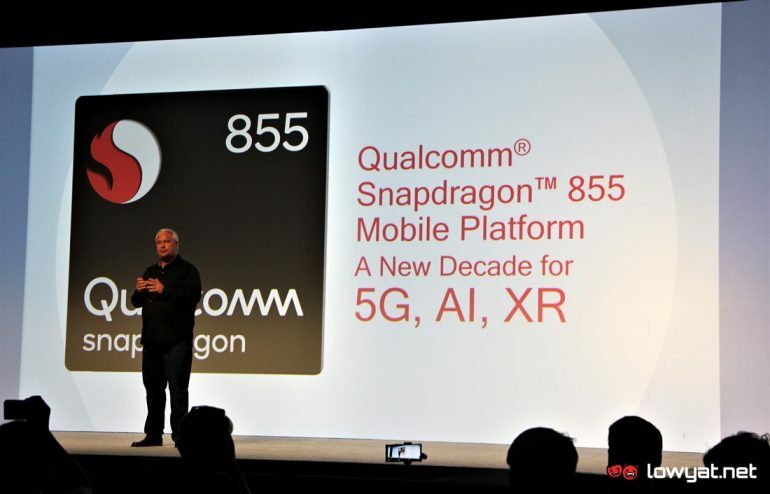 As promised, Qualcomm today has revealed more information regarding its new flagship processor, the Snapdragon 855 on the second day of its Snapdragon Tech Summit here in Hawaii. Among such details that the company has disclosed is a brand-new CPU design concept called Prime Core. 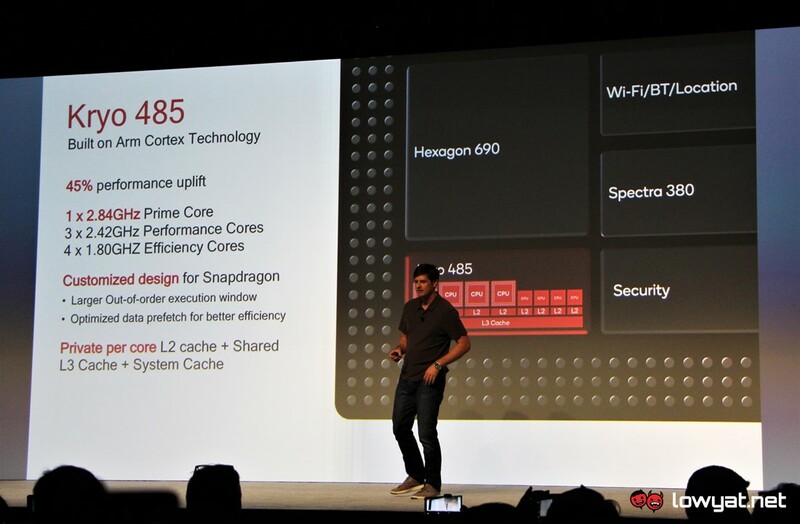 As opposed to the BIG.little setup that was implemented on its predecessors which carries an equal amount of efficiency and performance cores, the Snapdragon 855’s Kryo 485 CPU carries four 1.8GHz efficiency cores, three 2.42GHz performance core, and a 2.84GHz “prime” core. The company claimed that the new chip is able to deliver up to 45% more performance as compared to its predecessor which is apparently the biggest performance leap in Snapdragon’s history. 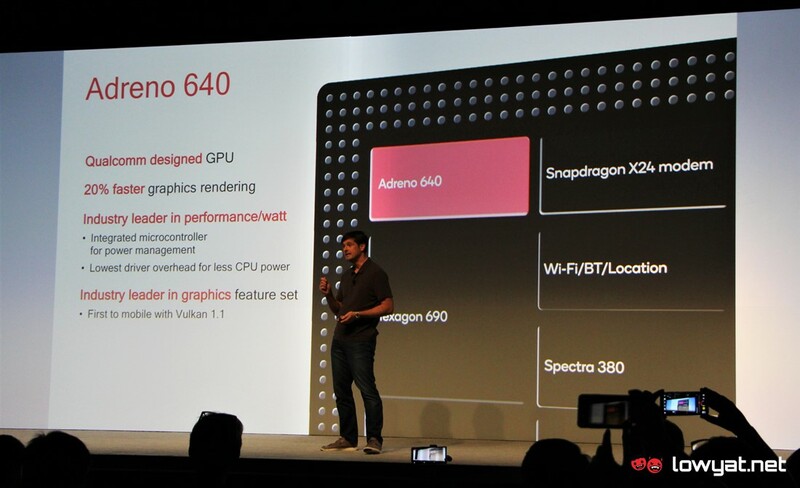 At the same time, the Snapdragon 855 also includes an Adreno 640 GPU which offers a performance increase of up to 20% when compared to previous generation GPU. Additionally, it also brings together the support for Vulkan 1.1 API, high dynamic range, and physically based rendering. Memory-wise, the Snapdragon 855 is able to support up to 16GB of LPDDR4x-2133 memory. 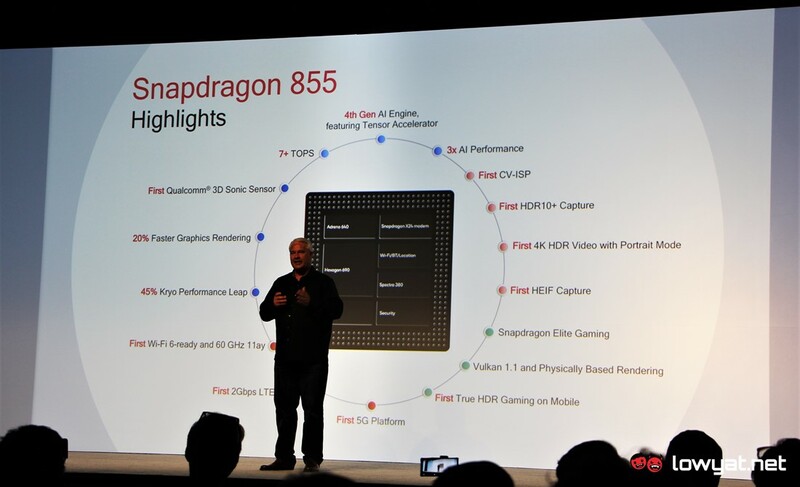 As mentioned yesterday, the Snapdragon 855 also features 4th Gen Qualcomm AI Engine which is said to offer 3x more performance than its predecessor and able to deliver more than 7 trillion operations per second. This is made possible through multiple new implementations and improvements throughout the chip including new Tensor Accelerator and increased amount of Vector eXtensions inside the chip’s Hexagon 690 Digital Signal Processor. 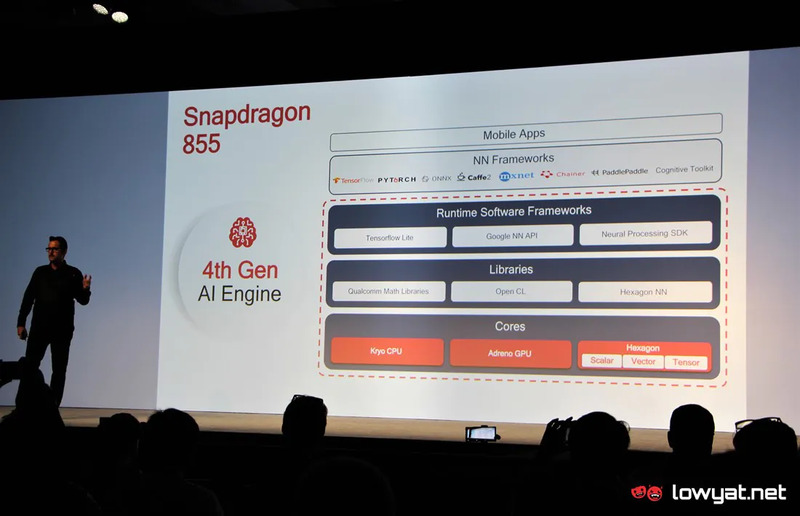 The inclusion of 50% more arithmetic logic units and new AI-oriented instructions within the chip’s Adreno 640 GPU also helped increased the AI performance of Snapdragon 855. At the same time, Qualcomm has also infused Computer Vision into the chip’s Spectra 380 Image Signal Processor that helps deliver hardware-based depth sensing alongside object classification and segmentation during video capture in real-time at 60fps in 4K resolution with HDR10 activated. The same ISP also helped Snapdragon 855 supports HDR10+ video capture and playback and the ability to perform hardware-based acceleration for H.265 and VP9 decoding as well as HEIF encoding. Natively, Snapdragon 855 is able to cater up to 20MP dual camera and 32MP single camera. 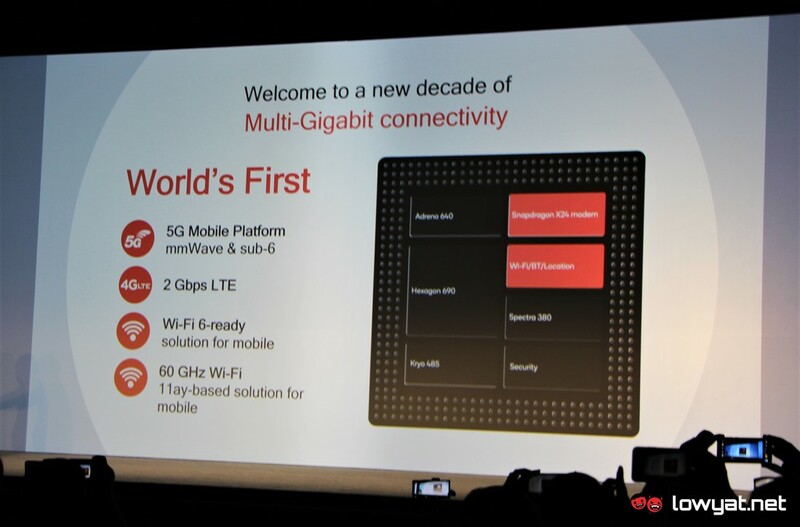 While it needs to be paired with the optional Snapdragon X50 modem in order to support 5G connectivity, Snapdragon 855 natively able to support LTE download speed of up to 2.0Gbps and LTE upload speed of up to 318Mbps via the integrated Snapdragon X24 modem. It also able to support next-generation Wi-Fi standards such as Wi-Fi 6 (802.11ax) and 802.11ay with a peak speed of 10Gbps. Not to forget, the chip is the first product that is able to support the newly announced 3D Sonic Sensor in-display ultrasonic fingerprint sensor. 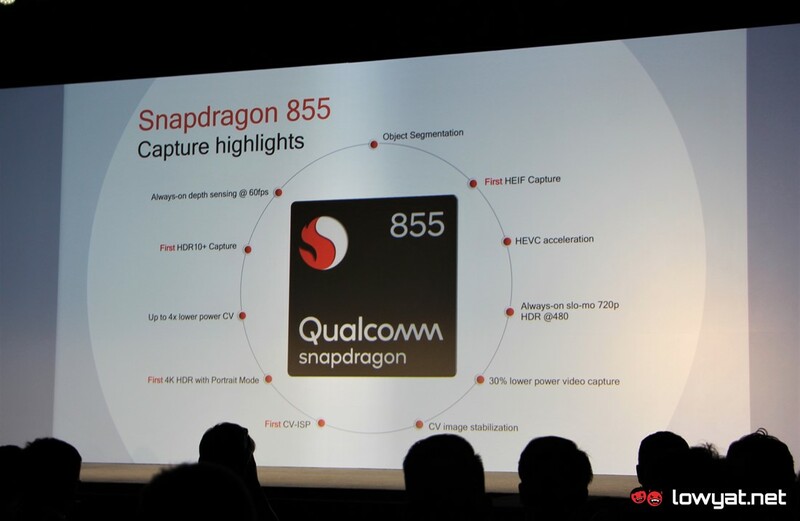 As per what we’ve mentioned before, users can expect to see products powered by Snapdragon 855 in the market within the first half of 2019. For more details regarding the chip, head on to Qualcomm’s official website.